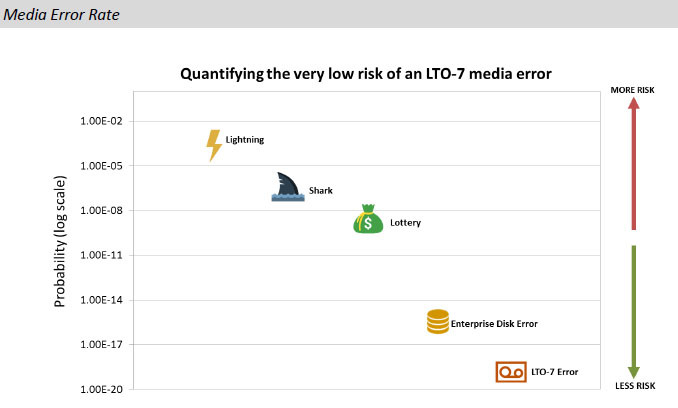 Did you know that it is more than a billion times more likely that you will get hit by lightning in your lifetime than you will encounter an unrecoverable LTO-7 media error? Nothing is more cost-effective, reliable, and energy-efficient for long-term data retention than tape. Per ESG, LTO’s role in the modern data center found that by looking at tape technology through a modern lens, it can provide speed, durability, and economic benefits that are undeniable. As part of their research, ESG became familiar with one of the largest super computing environments used for multiple research programs, including hurricane/tornado modeling, the Big Bang, and other critical applications. This system, which utilizes LTO storage, has a capacity of 380 petabytes (PB) – the equivalent of 5,054 years of HDTV video or a stack of books reaching over nine times the distance from the Earth to the moon. And no task is too big for LTO - when it comes to scalability for very large storage environments, ESG found that an LTO solution could be scaled to meet just about any storage needs. Tape technology has a long history in data protection, and even with the adoption of disk and cloud targets, it still plays a major role in many backup and archive environments. According to ESG research, 49% of backup environments leverage tape today with 23% relying solely on tape. Clearly tape is not a new concept for IT professionals, but some of its new features and best practices might be. ESG Lab confirmed that the addition of partitioning and LTFS adds compelling new uses cases for LTO technology. Now, this removable media can be easily used with its native utilities for file-level operations, and these file-level capabilities can be expanded to tape-as-NAS and tiered storage solutions. Also, when deployed with modern data protection best practices, tape—combined with disk and cloud components—can extend efficiency while providing customers with huge data storage flexibility. When it comes to reliability in tape-based data storage solutions, the number one priority should be the ability to access data when needed. A tape drive may fail, but if the data can still be read back with another drive, then retrieval is successful. Other important considerations include media durability, media shelf life, drive reliability, and probably most importantly, end-user best practices. ESG Lab began its review of LTO solution reliability by interviewing members of the quality assurance team from an LTO Program participant, along with exploring LTO media characteristics. LTO media was designed on the premise that it would be loaded into a device, written to, removed, moved, stored, recalled, and reloaded into a device when data needed to be retrieved. With that in mind, each consortium member is constantly working to keep LTO media highly reliable, portable, and rugged enough to be moved without impacting data integrity.